My eye was initially attracted to the bright colors of this red and black bug against a green leaf. As I looked more closely, however, I noticed what looks very much like a skull pattern on its back. Looking at the black parts and moving from left to right we have: Hair, two round eyes, a triangular nose and down-turned mouth. Spooky! After doing a bit of research I’ve concluded that it’s a Lygaeus equestris – commonly known as a black-and-red-bug, which sounds about right. These bugs can reach about 11 to 12 millimetres (0.43 to 0.47 in) in length. They have a characteristic red-black pattern, fully developed wings and long, powerful legs. The hemelytra have two transverse bands that reach the margin and a round white spot on the membrane. Scutellum is without bristles but with tiny hairs. The black band close to the eye is wider than the same. This species is very difficult to differentiate from Lygaeus simulans, that has a scutellum with long bristles, antennae with angulous tubercles and a larger red area on the head. The red-black pattern has a deterrent effect and serves to protect the insect (Mullerian mimicry or Batesian mimicry). By storing the toxic ingredients of their food plants, they are unpalatable to potential predators. 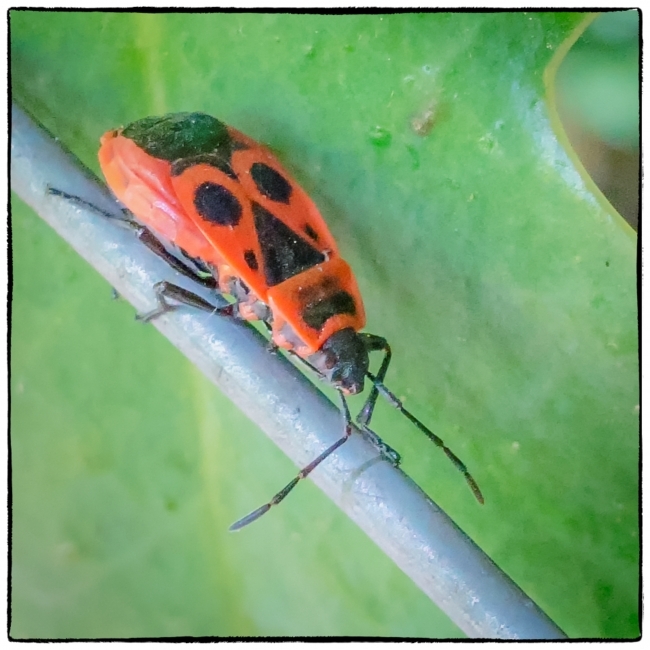 These bugs feed on plant juices, particularly milkweed (Vincetoxicum hirundinaria), Spring pheasant’s eye (Adonis vernalis) and sometimes also on dandelions.